When spring rolls around I start thinking about riding my bike outside. 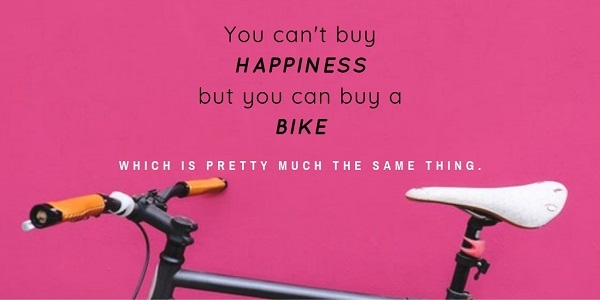 For me, happiness is bike riding. It reminds me of when I was 10, 11 and 12 years old. Lots of good memories of riding bikes as transportation to go visit friends, using the construction site around the corner as my personal BMX course, and having freedom to go where I where ever my bike could take me. Just seeing the weather get a little more sunny and a little less cold has me thinking about bike riding. Doing something you love, that just happens to help you get fit, is a real lucky thing, I think! This time of year is full of anticipation for me. I’m going to be gathering my equipment and checking out my bike. Now that the sun sets well after 7 pm, it gives me a chance to get a little riding in after work! Do you enjoy bike riding? Does it remind you of your childhood? If you’re not a bike rider, what do you look forward to in the spring?